While at 3GSM in Barcelona I had the opportunity to visit the NTT Docomo booth, where they were showing some interesting innovation in mobile devices. 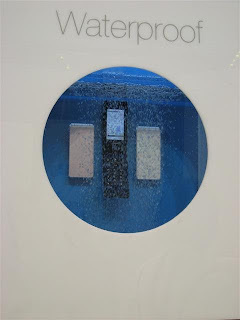 One unique feature of the phones they were showing is that they are waterproof. Yup, no fears if your 2 year old throws your phone in the bathtub, or your teenager insists that he doesn't need a coat in the rain. One model of the phone also has the equivalent of a panic button. 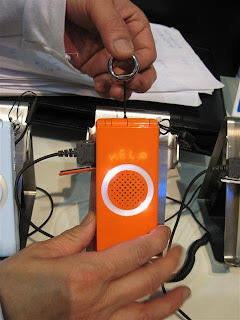 You put on a string and an alarm goes off, and "help" flashes on the phone. And finally, if your child forgets the phone another alarm goes off. This is implemented by attaching a band to the wrist or clothing of the child. The phone then identifies if the child is too far from it. 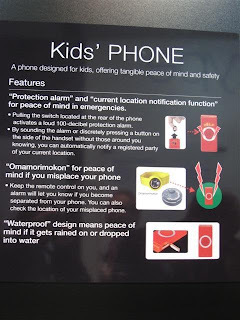 NTT also showed a prototype of a phone that will help you or your kids keep physically fit. It has features such as a workout music player, pedometer, heart rate monitor, and even a haliotosis (bad breath) monitor!